Schools across Washington State are gearing up for huge cuts and mass teacher layoffs – even as the state legislature claims they have fully funded public education. 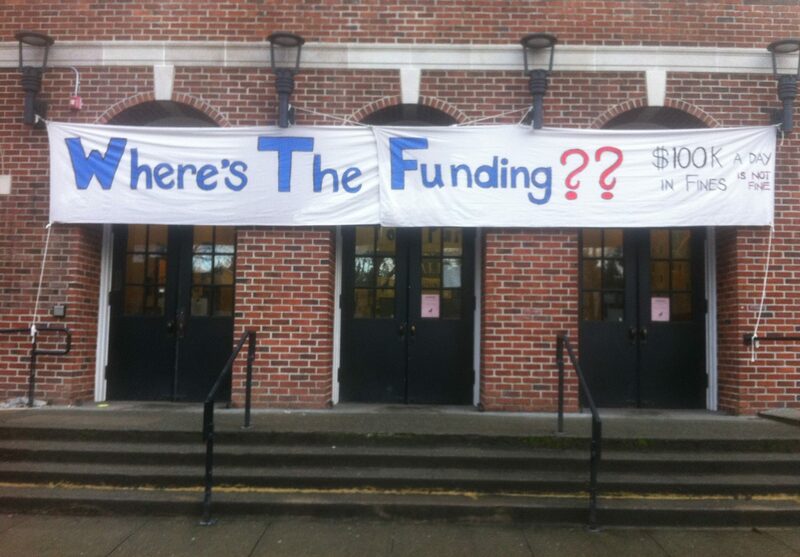 Washington’s Paramount Duty has mobilized parents across the state to fight these cuts by pressing legislators for more funds for public schools. We have two main approaches: more funding from the state via a capital gains tax, and restoring some flexibility to local levies. Unfortunately, some Democratic legislators are blocking both solutions and forcing the cuts to happen. They’ve added poison pill amendments that have derailed a bill to fix the school levy crisis, and are resisting a capital gains tax. And now some, like Senator Mark Mullet, are trying to defend their actions. To understand this issue, we first need to remember exactly why the McCleary case was filed and what the Supreme Court actually ruled. The Court agreed with the McCleary family that the state was failing to meet its obligation to fully fund public education. The use of local levies to help districts meet student needs was a symptom of the state’s failure – not the cause. The Court explicitly said it was not ordering any changes at all to the use of local levies for public education. It instead ordered the state to come up with more money for public schools. So when legislators claim they need to maintain limits on local levies or tighten rules about how they can be spent so as to avoid a “McCleary 2.0″ situation, they are simply wrong and demonstrate they don’t actually understand what the Court ruled. There was no need for the legislature to make any changes at all to local levies in 2017. There is no need for the legislature to limit teacher pay or bargaining rights. In theory, the levies should be used to supplement the state’s funding of basic education. In reality, the state has rigged the rules so that they never actually fully fund the basics. The state’s definition of “basic education” is so narrow that things we all agree are basic, like librarians and counselors, are still not fully funded in our schools. Local levies have to help fill that gap. In Seattle, for example, the state’s funding formula is so narrow that it only pays for a nurse less than 1/2 day a week at Northgate Elementary School, which has the highest rate of students on free and reduced lunch in the entire city. The school district must pay for the rest of a nurse from levies. The same is true for other needed specialists at this and numerous other schools across the city and state. Over the last two years, it has become clear the legislature did not fully fund public education and cut the levies too much. More than two thirds of school districts across the state – urban and rural, large and small, east and west – face big cuts because of those levy caps. In 2018, the Legislature cut $1 billion per year in local voter-approved school levies without approval from voters. This was not mandated by the Supreme Court and must be corrected before the end of the legislative session. Watch Supt. Reykdal explain why. Some of the Senators who supported poison pill amendments have made it clear they strongly oppose new, progressive revenue for public education. For example, Senator Mark Mullet emailed his constituents before a March town hall meeting that he firmly opposed any new taxes, including a capital gains tax, even to fund public schools. The State Senate Ways and Means Committee, on which Mullet serves, still has not passed a capital gains tax – and the Senate’s capital gains tax proposal doesn’t even go to public education. The only thing that would actually cause a “McCleary 2.0″ case is the legislature continuing to fail to fully fund our public schools. The Senators who say they worry about increasing local levies because they want more state funding are often the same ones who block attempts to pass that new state funding. We have also seen legislators try and claim that the poison pill amendments would not have cut teacher pay. But this is incorrect. The goal of one of the amendments was to slash extra pay teachers receive for duties above and beyond their normal requirements, for extra time, responsibility, and incentive – also known as TRI pay. Many teachers have been able to use the collective bargaining process to get more TRI pay to supplement the state salary structure so they can get something close to a wage that allows them to afford to teach in an increasingly expensive state. This is not a bad thing. Good schools need good teachers, and in our expensive state, teachers need better pay. As Mark Mullet acknowledged in his Seattle Times op-ed, the amendment was designed to restrict teachers’ ability to negotiate higher TRI pay. The result would have been an average pay cut of $5,000 per teacher in our state. He continues to advocate for cutting educator pay, but not school administrator pay, and for curtailing educators’ collective bargaining rights. It’s worth remembering that the Supreme Court also ruled, as part of the McCleary case, the state needed to pay teachers enough to attract and retain teachers. Teacher salaries are a state responsibility, but as with other aspects of basic education, the state continues to fail to fully fund the actual cost. Instead they rely on arcane and legalistic definitions that let them claim to the court they’ve fully funded it, even as schools and districts find they don’t actually have the money they need. Here again, legislators are trying to rig the rules of local levies and teacher pay in order to cover up for their failure to add more state money for public education. They act as if their paramount duty is to keep taxes low on rich people, or cap the state’s education budget. The constitution is instead very clear that their paramount duty is “to make ample provision” for public schools. This isn’t ample. It’s not even sufficient. The other of the two poison pill amendments would have required the state legislature to hand millions of dollars a year over to charter schools, even as communities across the country are pushing back against the expansion of charter schools. The state still has not fully funded its existing public schools. It is totally inappropriate to add any more money to charter schools until we know that every child is getting an excellent education in our public schools, with the necessary and full state funding to make that possible. The legislature has two weeks left to stop huge cuts to schools across our state by passing a levy fix, and help fully fund our public schools by passing new, progressive revenue like a capital gains tax. WPD will continue pushing back against misinformation and organizing parents across the state to push the legislature to meet their constitutional and moral obligations to our public schools.